Wefan is leaking from the world, and the blood-priests of the oppressive god Murak rise again to bring war to the lands of Dumnon. They search for those with Wealdan in their blood, for this gives them power. Power to twist, to alter and control, and ultimately to gain yet more power. In horrifying blood-rites practised on both humans and creatures, they gorge on the blood of innocents, destroying farms and families, conquering swathes of territory and gaining new followers. But not all Wealdan-infused blood carries the same intoxicating fuel. The blood-priests seek one above all others. Against a background of failing states, magik and spirits, Coryn and Katleya lose all that they have and must flee all that they know. Coryn, protected by a cracked amulet, must find his sister and fulfill an oath. Katleya has only her wits and her knives to defend herself. Desperate to reach a haven where she can learn to use her power fully, Katleya uses her Wealdan to do little other than see the Wefan. But she is hunted by those who would use her for terrible purposes of their own. A story as intricate and as powerful as any Weaving of the Wefan. 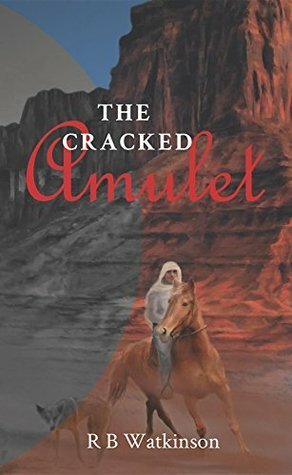 The Cracked Amulet is the first book in the Wefen Weaves series. At 300+ pages of small text, this is not a quick read! It is a story full of detail and rich description that lets you feel like you can really see the world of Dumnon as you follow Coryn and Katleya on their journey. The book did feel a little light on the action at times, but the likeable main characters, the realistic magical world they were travelling through, and their objectives were enough to keep me reading. This is what I would call high fantasy, and if that’s your thing, you should enjoy The Cracked Amulet. I’ll be on the lookout for book #2! R B Watkinson lives in the wilds of Devon on a smallholding surrounded by grown-up children, animals and gardens. She loves writing, gardening, writing, reading, more writing and, of course, more reading. Her favourite genre is fantasy, which she has devoured since childhood. R B Watkinson taught as a special educational needs teaching and also led reading groups for children – both excellent for learning how youngsters begin to appreciate books, a love they carry with them into adulthood. NOTE: I received a free copy from the book’s publicist, but all thoughts and opinions expressed are my own. Thanks for the review. Should be interesting for anyone that enjoys fantasy.